I am a “CAN DO” company. I strive to do the near impossible job. Drilling from any location (under homes, vaults, manholes, basements finish or not). I can drill under a slab home from under a water heater or a kitchen sink. There is no reason to tear up a lot of concrete or carpet in a building or landscaping outside to install piping under ground. When you have water, sewer, electrical, gas or cable to install inside or outside, I can help you get it install with very little disturbance to the landscape or concrete. 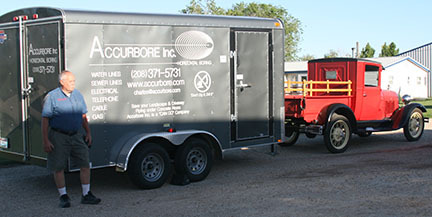 Call Accurbore and have a customer who is happy when the job is done. There is no reason to dig it if you can have Accurbore drill it. Rates start at $650.00 for one inch poly install, and $960.00 for of four inch sewer install. Minimum drilling fees are done from outside bore pits that are four to five feet long.